A revisited classic or a trendy new design, no matter the style you choose for your bar, the glassware you choose is vital. The Arcoroc New York range of glassware combines a classic style with a retro design feel to it. This stylish glassware features a range of glassware whether every item in the range is unique – just like its namesake New York where there is something unique on every block you walk down. 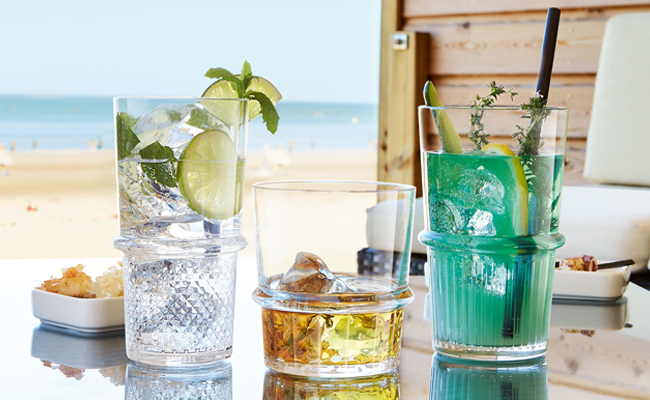 From a vintage inspired hiball to solid lines, each glass in this range is sure to make an impression on guests. This range of Arcoroc New York hiballs are ergonomic and stackable, which are ideal qualities for bar service. This range of Arcoroc glassware is fully tempered and toughened, which makes it extra resistant – five times for resistant than untreated glassware, which brings industry strength to glassware. Tempered glass is economical, resulting in fewer breakages, plus it is safe; when it breaks, it breaks into blunt fragments, to give catering professionals greater peace of mind. Tempered glassware boasts excellent shock and heat-resistance, coupled with exceptional heat-retention levels, provides a glassware that is designed to be long-lasting. This New York range of glassware offers style, elegance and robustness. Tempered glassware has an increased resistance, but the thickness of the glass is not increased. This range features four stylish glasses, featuring tumblers and hi-balls that are ideal for bars and restaurants looking for a unique style of drink presentation. Choose these New York hiballs from Arcoroc from Pattersons Catering Supplies and browse our extensive range of wholesale catering glassware. At Pattersons Catering Supplies, we’re leading experts in selling glassware, so we ensure we stock a wide variety of glassware for you to choose from. If you have any questions about this range of hi-balls and tumblers, please contact our customer services team on 0117 934 1270, or email us on web@pattersons.co.uk.